PLEASE NOTE: THIS ITEM CANNOT SHIP VIA 3-DAY DELIVERY.Molded plastic composition ball made for constant use. Yellow for easy visibility. Official size. 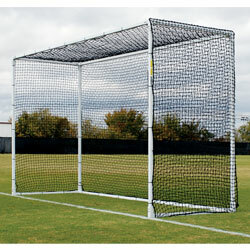 The Bownet Portable Field Hockey Net is official size 12' x 7' x 4' and sets up in 180sec for one person with two people you can cut that down to around 120sec. Rigid steel and fiberglass pole construction. The Grays GX2000 Oxygen field hockey stick is crafted with a composite matrix of carbon, aramid and fiberglass. The high fiberglass content ensures more power and durability. The GX1000 Composite field hockey stick from Grays features a super-lightweight construction of carbon, Kevlar(r) and fiberglass thats designed to deliver optimal balance, shock absorption and superior maneuverability. Safeguard your vision with the HS3000 field hockey goggles from Bangerz(r). They're crafted with a high-impact, one-piece shatterproof polycarbonate lens and a shock-absorbent brow bridge with padded nosepiece protection. The curved shield design delivers maximum peripheral and excellent down vision. The Grays GX9000 field hockey stick is crafted from a fully integrated carbon and aramid composite for consistent power, as well as excellent balance and feel. The Grays GX5000 #9056 goalie field hockey sticks composite construction allows great stick clears, while remaining thin and light for excellent control. It has a specially shaped blade and an extended hook, which increases the stopping area. The CranBarry Falcon field hockey stick is reliable stick used by many middle school players. Its well balanced and weighted and features an extended concept sport-grip.